With the release of the US 2018 National Security Strategy, Australia has an opportunity to renegotiate its role in international efforts to combat terrorism, a role that could be very important as a major player pulls back from the fight. For almost 20 years, the international community has focused on combatting the threats posed by transnational terrorist groups. The United States has been a stalwart supporter of these counterterrorism efforts, committing manpower, expertise, equipment and funding for a large array of initiatives. However, the recent release of the US 2018 National Security Strategy indicates that the United States’ priorities are changing, and in a significant way. The implication appears to be that, while a terrorist attack might be possible and its outcomes tragic, an attack on the United States by a state power would be catastrophic, particularly considering the armaments of the states in question. As such, the Defense Department has moved from battling Islamic State to conducting tabletop exercises of all-out war with Russia or China. This strategic shift appears to be prompted by the resurgence and renewed aggression of Russia—including its interference in Ukraine and possible interference in the US presidential election—and the increasing belligerence of North Korea. The American response to these threats will be the pursuit of a “peace through strength strategy” that looks much like a withdrawal to the realist-based tactics of the Cold War. This new approach is clearly visible in the NDS, which details a US focus on stronger military alliances and crafting a more robust and lethal military force to meet interstate threats. The NDS sums up the new defence ethos of the United States as, “The surest way to prevent war is to be prepared to win one”. This change in focus has several potential repercussions for international counterterrorism efforts. First, the Trump administration has outlined an approach that will rely heavily on military solutions for the counterterrorism efforts the US will support. A draft of the administration’s official counterterrorism strategy indicates that nation-building and democracy promotion are no longer seen as necessary and may, in fact, hinder military objectives. This approach overlooks basic counterterrorism lessons of the last 15 years. 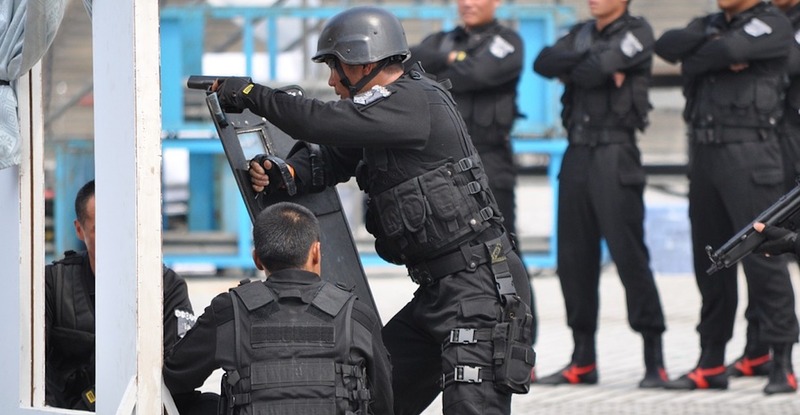 Recent research by the Global Terrorism Index has shown that abuse by the military or police is one of the largest drivers of terrorist recruitment, as is corruption and lack of trust between the government and its citizens. Promoting good governance and human rights is usually considered a core aspect of countering and preventing terrorist activities. It is unlikely that the mostly offensive actions listed in the National Security Strategy will address these issues and they have the potential to either foster or exacerbate the underlying grievances that drive individuals to terrorism. Second, the shift in focus away from counterterrorism likely means a shift in funding. The Trump administration has already indicated its intention to increase funding for the military. While this means an increase in US kinetic capabilities, it is likely that these capabilities will focus on fighting conventional armies rather than terrorist groups. At the same time, a draft of the Trump administration’s 2018 budget shows a massive decrease in the State Department and USAID budgets, with their funding being diverted to a program tied to national security objectives. This is despite the fact that the State Department and USAID engage in what could be considered ‘soft’ counterterrorism or counter-radicalisation work such as human rights promotion and good governance. By undermining US soft power, it is greatly reducing the tools available to the Trump administration to prevent and respond to terrorist threats. Third, a consistent theme in the Trump administration’s security policy is the demand that US allies take up more of the burden for international security in general and counterterrorism specifically. This indicates some potentially major challenges for current international counterterrorism initiatives that have relied heavily on US support. The withdrawal of US leadership in countering terrorism will shift the burden to other nations and international coalitions, many of which still lack necessary military and intelligence capabilities. While some members of the European Union may step up to fill certain gaps, it is likely that much of this burden will fall upon the United Nations, which has emerged in recent years as a coordinator for counterterrorism efforts despite its own institutional shortfalls. Unfortunately, US funding to the UN is also being reduced. The United States is the biggest contributor to the UN, paying 22 per cent of its core budget of USD$5.4 billion (AUD$6.8 billion) and 28.5 per cent of the USD$7.9 billion peacekeeping budget. The Trump administration proposed a reduction of USD$1 billion dollars from the United Nations budget, a move that a spokesperson for the United Nations declared, “would simply make it impossible for the UN to continue all of its essential work…”. At the moment, the US and the UN appear to have compromised on a reduction of USD$285 million, but demands that the UN do more with fewer resources will make difficult counterterrorism efforts even harder. The international consequences of the Trump administration’s national security, national defense and counterterrorism strategies on the international community’s overall approach to countering terrorism is not yet clear. The United Nations may be able to fill the leadership vacuum but it will be unable to replace the reduced financial, military and intelligence resources. These burdens will need to be met by other nations with the necessary resources and capabilities, such as members of the European Union, Canada and Australia. Otherwise, the international community may find itself with no counterterrorism strategy of its own. Given Australia’s long-term investments in counterterrorism, Canberra will likely be watching the developments in the US closely. Australia has already shown bilateral and regional leadership by partnering with Indonesia and the Philippines to train soldiers, prevent the exportation of foreign fighters, counter radicalisation, address terrorist financing and share intelligence. 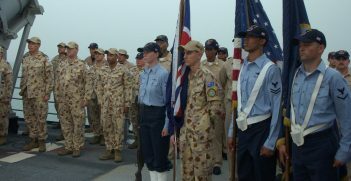 Regionally, Australia joined 17 other nations at the ASEAN Defense Ministers’ Meeting-PLUS (ADMM-Plus) to participate in a regional maritime security and counterterrorism exercise in Brunei and Singapore in May 2016. Australia could play an important part, at least regionally, in ensuring that the progress made against terrorism so far is not lost. The receding presence of the United States in the counterterrorism sphere means that now is the perfect time for Australia to determine what type of leadership role it wants to forge for itself. Shannon Zimmerman is a PhD researcher at the Asia Pacific Centre for the Responsibility to Protect in the School of Political Science and International Studies at the University of Queensland. The Timor Sea Disputes: Resolved or Ongoing? 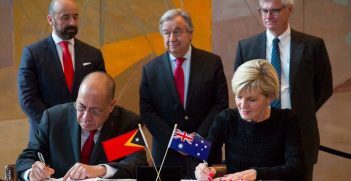 This week Australia and Timor-Leste signed a historic maritime treaty at the United Nations in New York. Unfortunately, the dispute over Greater Sunrise is far from being resolved. 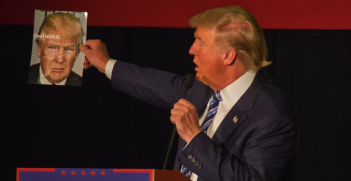 While foreign publics don’t get to vote, their opinions matter to the United States. Even as the world’s sole superpower, the US requires the cooperation of other states to achieve many of its foreign policy objectives.